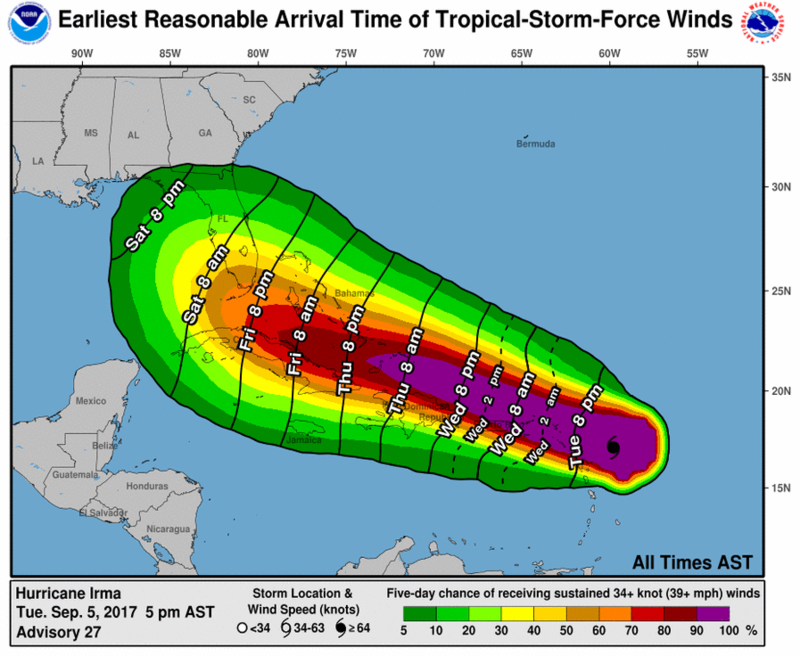 Hurricane Irma is officially one of the strongest Atlantic hurricanes ever recorded, and the Category 5 storm is expected to slam the eastern Caribbean islands with devastating winds, heavy rains, and catastrophic storm surges. At 5 p.m. ET on Tuesday, Irma was 130 miles east of Antigua with maximum sustained winds of 185 mph. 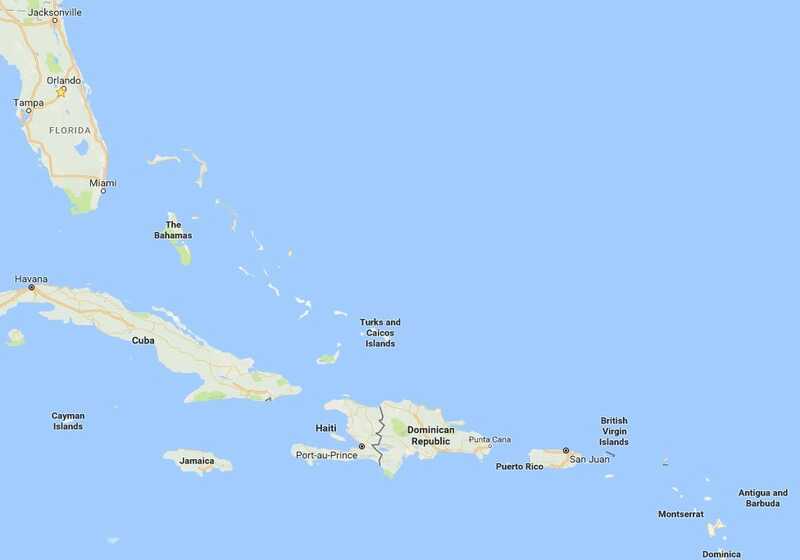 The National Hurricane Center predicts the storm will hit the Leeward Islands, the chain of islands separating the Caribbean Sea from the Atlantic Ocean, starting Tuesday night and continuing into Wednesday morning. Irma will most likely begin battering Puerto Rico and the surrounding islands Wednesday afternoon, moving into the Dominican Republic and Haiti on Thursday and Jamaica on Friday afternoon. Florida and Cuba could see the storm by Saturday and Sunday, but since that forecast is five days out, the weather models still aren't sure of Irma's location or strength by then. Hurricane warnings are in effect for Antigua, Barbuda, Anguilla, Montserrat, Saint Kitts and Nevis, Saba, St. Eustatius, Saint Martin, Saint Barthelemy, the British Virgin Islands, the US Virgin Islands, Puerto Rico, Vieques, Culebra, the Dominican Republic, and Cabo Engano. Those islands can expect hurricane conditions within the next 36 hours. Hurricane watches are in place for Guadeloupe, Haiti, Turks and Caicos, and the Bahamas. Those islands can expect tropical-storm conditions within the next two days. "Irma poses the most serious hurricane threat to northern Cuba and Florida since at least Hurricane Andrew" in 1992, Jeff Masters, a meteorologist, wrote on Weather Underground, adding that the storm was "still strengthening." While Hurricane Harvey brought devastating floods, Irma's biggest threat is likely to be its strong winds. 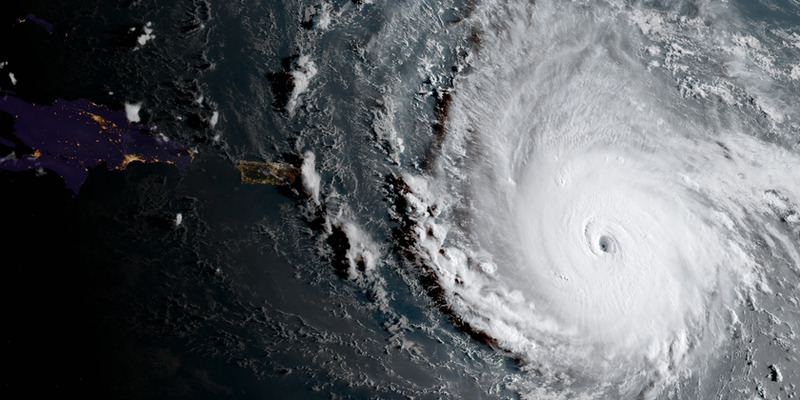 The Saffir-Simpson scale of a hurricane's intensity goes up to Category 5, but if it were extended to classify Irma's wind speeds, it could be considered a Category 6. That type of wind speed can destroy most framed homes, topple trees, and knock out power lines. The NHC expects Irma to remain a Category 4 or Category 5 hurricane for the rest of the week. The storm surge — the quick rise in water caused by a hurricane's strong winds — and wave height could be devastating as well, particularly for low-lying Caribbean islands. The NHC projects storm-surge heights above normal tide levels of 15 to 20 feet in Turks and Caicos, 15 to 20 feet in the southeastern Bahamas, 3 to 5 feet on the northern coast of the Dominican Republic, and 1 to 3 feet on the northern coast of Haiti. Surge heights above ground could reach 7 to 11 feet in the Virgin Islands, 3 to 5 feet on the northern coast of Puerto Rico, and 1 to 2 feet on the southern coast of Puerto Rico and St. Croix. Rainfall could reach 8 to 12 inches across the northern Leeward Islands, with some areas seeing up to 20 inches. Puerto Rico and the Virgin Islands should expect 4 to 10 inches of rain, with totals up to 15 inches. From Wednesday to Saturday, Irma could dump 8 to 12 inches of rain on the Bahamas and Turks and Caicos, with isolated totals reaching 20 inches. Northern Hispaniola could get 4 to 10 inches, with some areas seeing 15, and southwest Haiti could get 1 to 4 inches. The rains could cause flash flooding and mudslides, the NHC says. 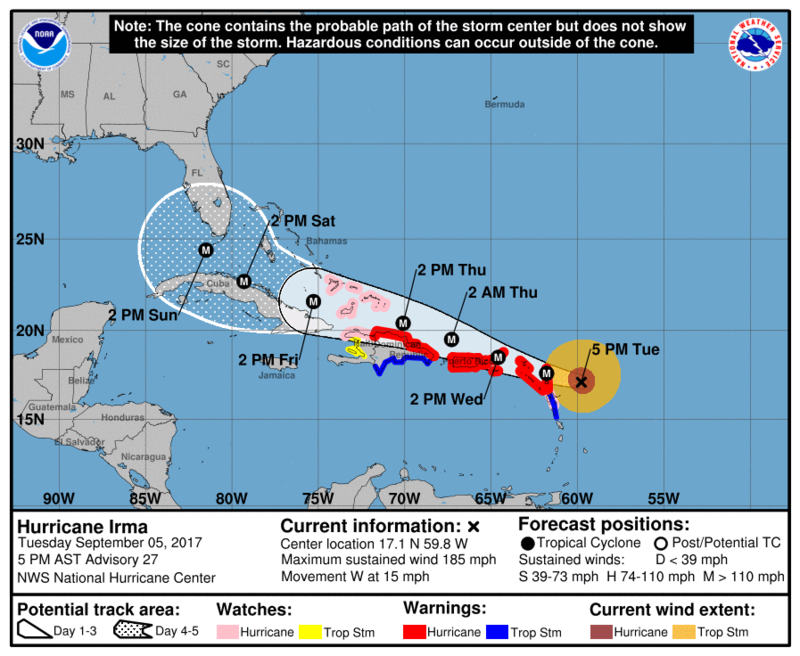 While the NHC isn't certain whether Irma will make landfall in Florida as a catastrophic hurricane, forecasters say residents should heed the advice of local officials and get ready if they are in the likely path of the storm. 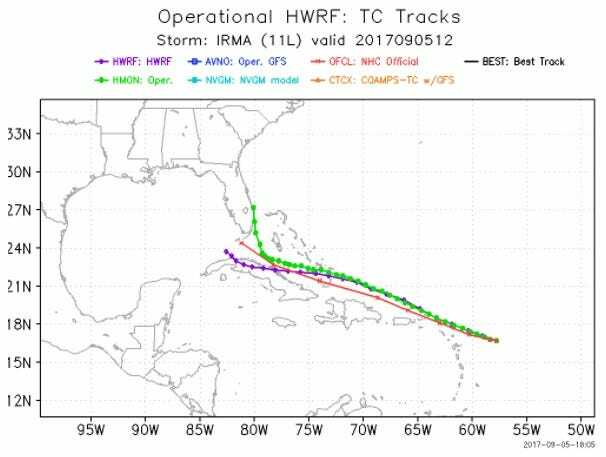 Forecasters also don't yet know whether Irma will move up the East Coast. "Since Irma is a large hurricane, [forecast] users are reminded to not focus on the exact forecast track since tropical-storm and hurricane-force winds and life-threatening storm surge extend far from the center," Daniel Brown, a senior hurricane specialist at the NHC, wrote on Tuesday, urging residents of the Leeward Islands to prepare as soon as possible. "Everyone in hurricane-prone areas should ensure that they have their hurricane plan in place," he wrote.